Slough Jets welcomed Andre Payette and the Sheffield Steeldogs to the Hangar for the league and cup points in the team’s first meeting on Slough ice this season. The battle of the import goalies could have produced a low scoring game but Ciaran Long beat Dalibor Sedlar just 13 seconds in but Lee Haywood made it 1-1 at 10.15 with a powerplay goal. Slava Koulikov doubled up Slough’s score at 14.39 and Mindy Kieras made it 3-0 at 15.02 and Payette took the visitors time-out. 2.05 later Long’s second was in the back of the net at it was 4-1. The middle period passed by scoreless but back for the third goals were on the menu. Koulikov netted a powerplay goal at 48.55 to make it 5-1. Steve Duncombe made it 5-2 at 50.08 when his shot was deflected in. With 3.18 left to play Ales Padelek made it 6-2 but 6 seconds later Craig Elliot bagged the final goal of the game closing the scoring at 6-3. Slough Jets entertained Guildford Flames for the second time in the season, this game only for league points. Two officials took charge of the game and two early goals gave the visitors a lead when Curtis Huppe scored at 7.26 and Stuart Potts scored at 10.58. It was with Branislav Kvetan serving an interference penalty that Dan Davies netted a 5 on 3 powerplay goal making it 1-2 and the first interval was taken 3.03 later with the score still 1-2. Slough won the second period thanks to the equalising goal from Tomas Valecko at 26.56 followed by the go ahead goal from Frantisek Bakrlik at 31.20 scored on a powerplay. Slough’s lead lasted 2.12 until Ben Campbell levelled the game at 3-3 and with neither team scoring again the second interval came around at 3-3. Not long into the third period Guildford found the back of the net but only after the net had been dislodged from it’s moorings resulting in a no goal. Both teams traded penalties and powerplays but neither could break the deadlock until David Longstaff scored with 3.17 left to make it 3-4. A time out followed with 1.37 remaining and Slough opted for the empty net but Longstaff netted his second at 58.33. Even a powerplay at the end of the game for Slough couldn’t help them equalise and Guildford took the full points. 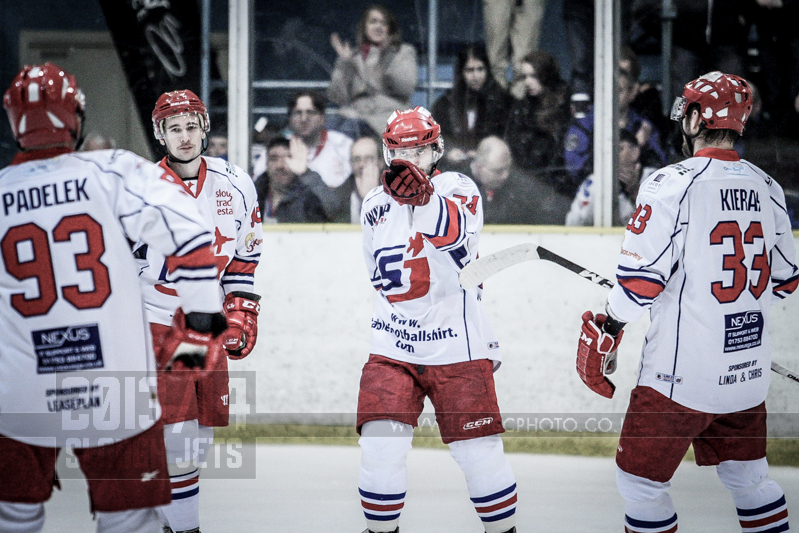 Slough Jets welcomed Peterborough Phantoms to the Hangar for their first visit of the season. Both teams felt each other out in the early stage of the game but Slough broke the deadlock when Tom Carlon scored against his former team at 13.15. Darius Pliskauskas then netted Slough’s second 1.06 later before James Spurr scored at 15.52 to half the lead. Neither team added further to their tallies and the first period ended 2-1. The second period saw Slough wrap up the game with a 4-1 period starting with Andrew Melachrino scoring his first Slough Jets goal at 21.53. James Ferrara then scored a powerplay goal at 26.06 to make it 3-2 but Adam Calder scored 10 seconds before the half way point to make it 4-2. Joe Greener scored at 36.54 making it 5-2 and Aaron Connolly scored at 37.26 to complete the 4-1 period. The third period saw Slough killing off three penalties including a spell of 5 on 3 before getting their only powerplay opportunity but despite all the special team opportunities there was no further scoring and Slough completed their win at 6-2. Slough welcomed Telford back to the Hangar for the second time in the season with a home and away win already over their opponents. The teams played out a near scoreless first period with the visitors just edging the shot count but with 1.47 left in the period Doug Sheppard gave the home team a 1-0 lead to take to the interval. The second period started the same way the first had and after a long shift Pete Russell called Slough’s time-out to rest the team at 25.10. Slough moved 2-0 ahead at 27.32 through Darius Pliskauskas and the same player then made it 3-0 with 1.57 remaining in the middle period. After a tight game at Romford a couple of weeks ago it was Slough Jets’ turn to host the Raiders for the return league/cup match. 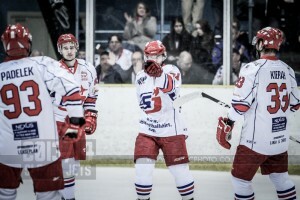 After a steady start to the game Slough took the lead after 190 seconds when Peter Poljacek netted and then proceeded to kill off three penalties, including a 5 on 3 spell. Romford’s first penalty allowed Slava Koulikov to convert the advantage at 17.01 to make it a 2-0 opening period. 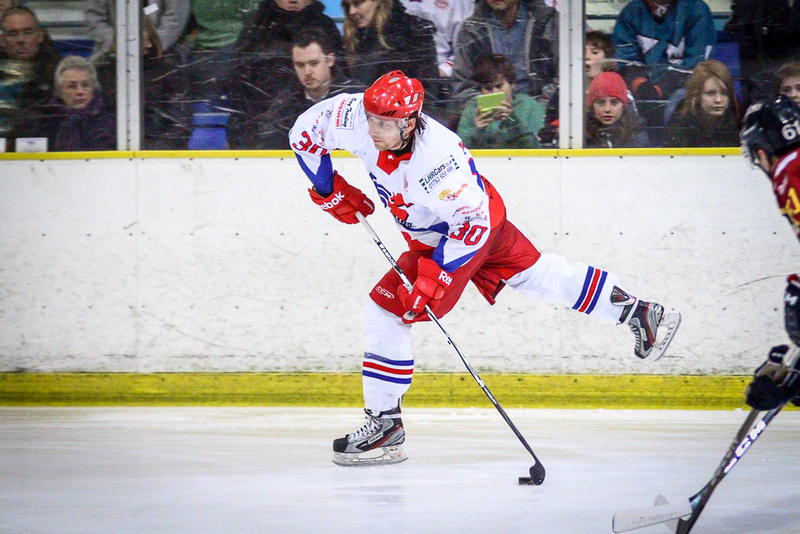 The middle period saw Slough wrap up the game as Ciaran Long netted the game winning goal at 20.50. Euan King played well in the visitors net keeping the home team scoring down but just after the half way mark Poljacek scored his second to make it 4-0. Captain Blaz Emersic added another 47 seconds later at 31.39 and Romford called their time-out. Jesse Hammill broke the shut-out at 35.28 but the home team still held a clear 4 goal lead come the interval. Slough changed netminder and Charles Kaylor took to the ice for the final period. Frankie Harvey scored for the visitors at 44.24 but that ended their scoring while Slough still had 3 more goals to come. Michael Bowman found the back of the net at 49.41 and again 5 minutes later and Koulikov scored his second goal at 58.05 to complete the scoring.